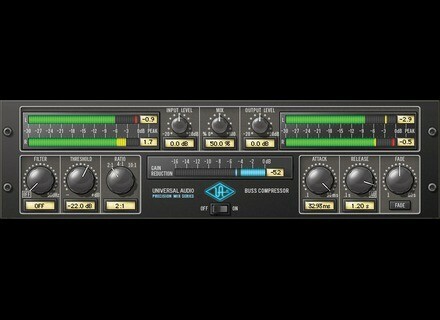 Precision Buss Compressor, Software compressor from Universal Audio in the UAD Plug-In series. Typical U-Audio everything works perfect. The Precision Buss Compressor is a dual-VCA-type dynamic processor that yields modern, transparent gain reduction characteristics. It is specifically designed to “glue” mix elements together for that cohesive and polished sound typical of master section console compressors. A flexible and intuitive tool, the Precision Buss Compressor is intended primarily for controlling the final output of your mix, but can be usefully applied to a variety of sources from drum busses or overheads to vocal groups, or even as a channel compressor on individual track inserts. The Precision Buss Compressor’s control set features Threshold, Ratio, Attack and Release, with all parameters specifically tailored to buss compressor usage. The Release control includes a multi-stage Auto Release also designed for a wide variety of program material. Input and Output Gain control is offered with metering for input, output and gain reduction. A high pass Filter is offered for the internal control signal sidechain to reduce the sensitivity of the compression to lower frequencies while retaining them in the output sig- nal. An automatic Fade feature is included, which allows the user to set a cus- tom fade-out or fade-in of the mix between 1 and 60 seconds long. Rounding out the feature set is a Mix control that allows the user to achieve “parallel” style dynamics control, without the need for a second buss or channel. When Ratio is set to 2:1, the Threshold range is –55 dB to 0 dB. When Ratio is set to 4:1, the Threshold range is –45 dB to +10 dB. When Ratio is set to 10:1, the Threshold range is –40 dB to +15 dB. Slower release times can smooth the transition that occurs when the signal dips below the threshold, especially useful for material with frequent peaks. However, if you set too large of a Release time, compression for sections of audio with loud signals may extend to lengthy sections of audio with lower signals. I spent much time looking for a compressor vst drinking, I really tried a lot, and I must say that I finally find my happiness!